It is very easy to download media files from Web Page using Digital Media Converter Pro. You can add web media for conversion or simply viewing. 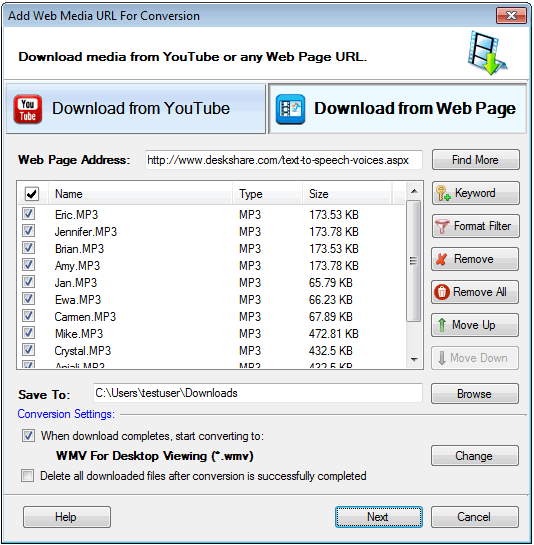 You can search for and download media from any Web Page. Enter the Web Page URL and click on the Search button. Digital Media Converter Pro will start searching media files in the entered URL and add them in the list. If the Web Page you entered has links to many different media files then you can filter on a multiple keywords separated by semicolon (;). For example, if you enter keywords like Michael Jackson;1984 then it will search the media files with name containing the Michael Jackson or 1984. You can also search the media files by selecting file formats as the filters, so it will search the files only of the given format. When finished searching the media URL, click Next button to start the download of the files. Copyright © DeskShare. All rights reserved.